11:32 p.m. Six minutes before the first of the rockets hits the square, so right now nothing's burning except for grill-fat. This is Inangela, and we don't know her yet but we'll take the straightforward, statistical things for granted. She weighs 174 pounds; she's slightly shorter than she needs to be, although obviously high-heeled boots are de rigueur for someone in her position; and despite having the kind of cola-black hair that looks as if it evolved as camouflage for nightclubs with broken strip-lighting, it's bright red at the ends where a drunken experiment with scarlettine unexpectedly became a fashion statement halfway through. But if we're talking about fashion statements, then it's hard to get away from the mask. Contrary to what we might expect by now, the mask doesn't mark her out as a member of a death-obsessed guerrilla cult any more than combat pants on a twelve-year-old boy mark him out as a member of a military junta. So what does it say about her? This not-quite-fetishwear, this mask that looks like bone but really must be some kind of mass-produced polymer? Does it say that she's showing off? That she believes in something specific? That she doesn't believe in anything specific, and that this is her way of proving it? That she liked the colour? Now, this alleyway - with all its archaeological layers of advertising - is set just off the square, so Inangela's got a good view of the town's central, fat-insulated artery from where she's sitting. It's not just about seeing, though. There are places to eat in the square, most of them stalls with their counters open to the air, breathing out blood-hot paprika-smoke while the rest of the town gets ready to freeze. Maybe it's a rare and exquisite combination of factors, or maybe it's just that there's no difference between one counter and the next, but you're downwind of the stalls wherever you go and the smells never contradict each other: however savage the competition might be between the vendors, it's as if all those razor-thin slices of sausage are rolling their eyes (metaphorical eyes, we hope) and deciding to co-operate while the humans fight among themselves. Things are frying tonight, and every night. It sinks into the air in the same way it sinks into the oil, so the atmosphere here in the alleyway is like every vegetarian's memory of how great bacon used to taste. Just a few hours from now Inangela is going to have her own encounter with the Great Urban Horror. Or at least she's going to think so, but by that point her consciousness will have been subtly altered by (in no particular order) chocolate, alcohol, onion rings and all the background radiation that the modern world can muster. All of which makes her sound incredibly selfish, as if it doesn't take more than a few deep-fried chemicals to turn her into the centre of her own urban legend, but let's be fair. This town is a town in wartime: this generation is a generation raised on shellfire as well as spare ribs. The food isn't the only thing that's liable to hyper-stimulate the nervous system. We all have to go through these initiations. Little ones, anyway. We'd like to think that Inangela hides her face behind a big shiny bat-skull because she wants the attention, and to be honest that's not entirely untrue. But she's young. She's only nineteen. If this weren't a time of war then we'd say she just needs to get it out of her system, although really it's more a kind of longing. Cut off from the rest of humanity by so many things - by her thoughts, by her words, by a culture which showers the world around her with warheads and acts as if it's perfectly normal for the War to go on forever, and of course by her exemplary fashion sense - it'd be truer to say that she just wants to be where the action is. To have one of the rockets detonate less than six feet from her body: to be able to say, in a world where everyone sees things happen at a distance, that she's been in the middle of the Warzone and Dear God she knows what it feels like. We might have guessed as much. 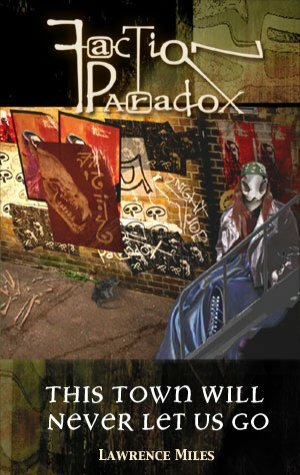 Because we are, for the purposes of this story, the elders and archons of Faction Paradox. That's the kind of audience Inangela wants, so that's the audience we're going to give her. The ones who watch from outside history, who pay attention to impeccable creatures like her because obviously she deserves to be rewarded for being more interesting than anyone else. A clique of ancient, nigh-immortal beings who reject the ways of the ruling class and smile on those who wear the right badges&#65533; well, it could almost be a kind of wish-fulfilment. So tonight - for one night only - we'll be in charge of the Faction, at its best, at its brightest, at its shiniest, before the worst days of the War and before its lapse into sheer ruthless bloody-mindedness. We'll watch everything Inangela does, we'll applaud her as she either (a) saves or (b) destroys the world as she knows it, and come the dawn we'll rate her adventures out of ten. Although she may lose marks for that coat. By the time the rockets reach the square at 11:38, Inangela has already left the area. At midnight precisely she'll become a heroine.